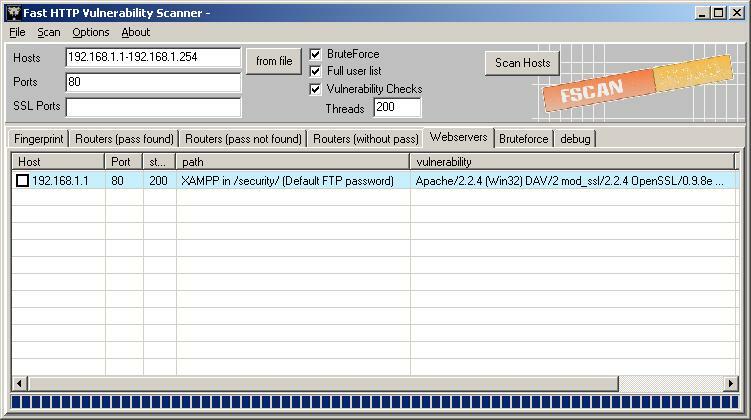 We have been developing Fast HTTP Vulnerability Scanner as an alternative for reviewing http devices over the network. This tool is able to check the security of your routers by identifying the login entry point and checking more than 160 default passwords. Make pentests easier with this multhreading scanner and get nice html reports. – CORE: Full multithreading HTTP/1.1 support. – CORE: Authentication basic, digest, ntlm. – Generic vulnerabilities like HTTP proxy identification, directory listing and default webpages. – CSS and more detailed html reports. – New Gui interface under win32 (currently broken). – Support for win32 and linux platforms.